A long-lived satellite launched in 1997 to measure rainfall in the tropics has run out of fuel and will probably fall back to Earth within the next three years, NASA officials said this week. The Tropical Rainfall Measuring Mission -- a joint project between NASA and the Japan Aerospace Exploration Agency -- has outlived its original three-year life expectancy, and officials say the satellite will continue collecting science data until early 2016, when the craft's instruments will be switched off to prepare for re-entry. Pressure readings from the TRMM satellite's fuel tank July 8 indicated the satellite was at the end of its fuel, according to an update posted Tuesday on the mission's website. "As a result, NASA has ceased station keeping maneuvers and TRMM has begun its drift downward from its operating altitude of 402 kilometers (250 miles)," the update said. Without propellant to maintain its orbit, TRMM will lose altitude over the coming months due to drag from the thin upper reaches of Earth's atmosphere. The satellite's descent rate will increase with time as the craft falls into denser layers of the atmosphere. Officials kept a small amount of fuel aboard TRMM in reserve for debris avoidance maneuvers to avoid collisions with space junk. The satellite will be uncontrolled when it dips back into the atmosphere, and it could come down anywhere between 35 degrees north and south latitude. Most of the craft will burn up, but experts expect some fragments will survive to Earth's surface. "The estimated timeframe for re-entry of TRMM is between May 2016 and November 2017," said Steve Cole, a NASA spokesperson. "The large window at this time is due to the uncertain role of the sun's influence on Earth's atmosphere." A decision made in 2005 by then-NASA Administrator Mike Griffin to extend TRMM's operations meant the mission would consume propellant originally set aside to lower the spacecraft's orbit for disposal over a remote stretch of the uninhabited South Pacific Ocean. Griffin's decision came after a report by a National Research Council panel recommended that NASA abandon plans to end the mission in time to ensure the satellite's re-entry could be steered away from populated areas. A risk review conducted by NASA in 2002 put the probability of a human injury or death caused by TRMM's uncontrolled re-entry at 1-in-5,000, about twice the casualty risk deemed acceptable for re-entering NASA satellites. The review said the additional risk of an uncontrolled re-entry could be "tolerated in return for other (public safety) benefits." Griffin and scientists agreed, concluding that data collected by TRMM could aid in forecasting tropical cyclones, improving intensity predictions and potentially saving lives. The casualty risk from TRMM's re-entry is lower than other recent unguided satellite re-entries, such as the fall of NASA's Upper Atmospheric Research Satellite and a German X-ray astronomy satellite in 2011. The re-entry of the European Space Agency's GOCE gravity mapping satellite in 2013 posed a lower risk than TRMM. Without fuel, the TRMM satellite has a mass of 2,621 kilograms, or 5,778 pounds. Assembled at NASA's Goddard Space Flight Center in Maryland, TRMM launched Nov. 27, 1997, on an H-2 rocket from Tanegashima Space Center, Japan. The satellite is equipped with a precipitation radar -- the first of its kind to ever fly in space -- to look inside tropical cyclones and measure the structure and intensification of the storms. TRMM's microwave imager can measure the quantity of water vapor inside clouds and the intensity of rainfall. 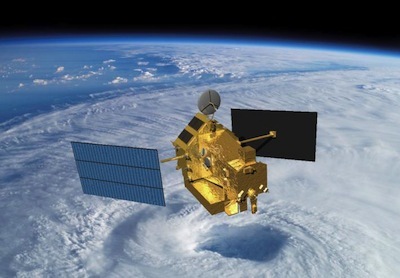 The satellite also carries instruments to detect lightning in the tropics and study cloud types. Another instrument on TRMM was designed to study how solar energy drives Earth's weather and climate, but the sensor failed several years after the satellite's launch. NASA and JAXA launched a follow-on satellite named the Global Precipitation Measurement Core Observatory, or GPM Core, in February with upgraded instruments to cover a larger swath of the planet. Initial data from one of the GPM satellite's instruments has already been released to aid forecasters for this year's Atlantic hurricane season. GPM's science payload is sensitive to lighter precipitation than TRMM, and the new satellite flies in orbit covering territory between 65 degrees north and south latitude. TRMM's observations are limited to heavy rainfall in the tropics.